549 continuing education activities (live and enduring materials). 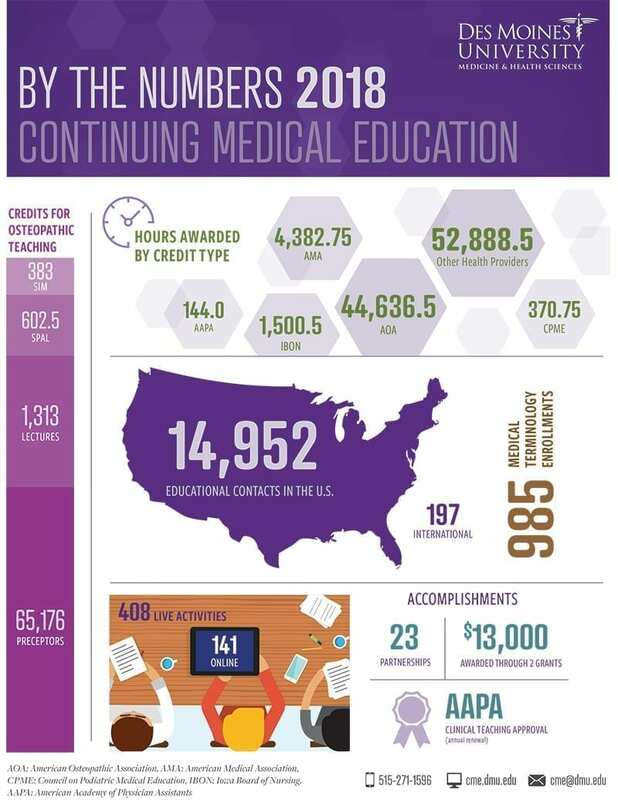 103,923 continuing education hours were awarded. 15,149 educational contacts were made worldwide. 985 people completed the Medical Terminology Course. 67,475.50 credits were awarded for osteopathic teaching. The CME team grew by one member in October with the addition of administrative assistant Luann Tucker, who brought several years of experience as the administrative assistant at Carlisle High School in Carlisle, IA. Other team members include the director, Vanessa Gray, M.H.A., who has been with DMU since 2010, and coordinator, Christina Billings, M.P.H., who has been with the University since 2014. DMU partnered with 23 organizations to develop 93 educational activities in the past year, including: After Cancer, Solutions for Sexual Health, All Care Health Center, Broadlawns Medical Center, Cancer Center of Iowa, Capital Chiropractic & Rehabilitation Center, International Spine & Pain Institute, Iowa Academy of Otolaryngology, Iowa Academy of Physical Medicine and Rehabilitation, Iowa Arthritis and Osteoporosis Center, Iowa Association of Pathologists, Iowa Health Care Association, Iowa Healthcare Collaborative, Iowa Hospital Association, Iowa Medical Society, Iowa Neurological Association, NAMI Iowa, OneIowa, Primary Health Care Inc., Rheumatology Association of Iowa, Southwestern Iowa Mental Health and Disability Services, the International Spine and Pain Institute, University of Northern Iowa and Wesley Life. Thanks to all for supporting the CME program. We look to the future with great optimism and a commitment to continue our history of excellence in program development, dedicated to designing, delivering and evaluating quality educational experiences/opportunities that stimulate, educate and empower health care professionals. If you’re interested in learning more about our educational offerings, please visit the calendar or online catalog.